A Triad in Time - Gharapuri, Ambarnath and Pataleshwar - Ghumakkar - Inspiring travel experiences. From Gateway of India, Mumbai. it was one astounding panorama! 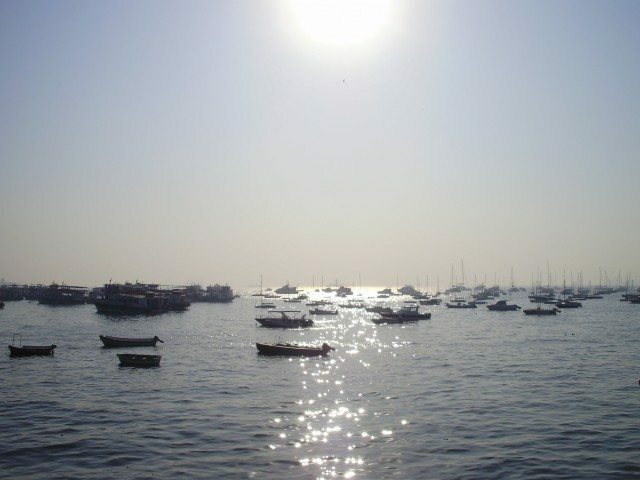 The Arabian Sea splashing and waving, the yachts and boats swaying on the green surf and the morning sun weaving golden strands on that vast waterscape. We were all ready to board a ferry to an island not far off. Leaving behind the majestic landmark of ‘Taj’ and citylife of Mumbai, slowly waking up, the packed ferry boat started chugging towards the island famously knows as Elephanta but locally known as ‘Gharapuri’. This is a funny journey, we are actually moving towards mainland. Elephanta is one small drop of island nestled all around by mainland of India and extended tip of Kolaba. As Halfway through the journey you see a mountain jutting out from sea, all covered in forest, sitting silently watching the landmass a few kilometers away surrounded by those eternal turbulent waters. 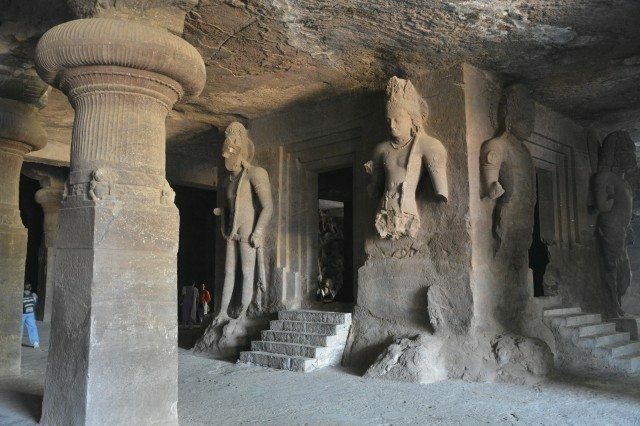 Elephanta island is host to some of the exquisite carvings done in basalt rock. The largeness and grandness of the caves and inside sculptures is something you can just marvel at. Dated by experts between 8’th and 10’th century AD, we see seven rock carved enclosures on this island. a moderate climb of 100-150 steps takes you to the top of the hill and there overlooking the sea and mainland beyond, you see the first cave with large pillars with cushion capital, marking its grand entrance. The most important sculpture here is the Trimutri, 3 faces of Mahadev which have found its space on Maharashtra tourism logo as well. Nearly full length of wall, the faces are very skilfully carved. 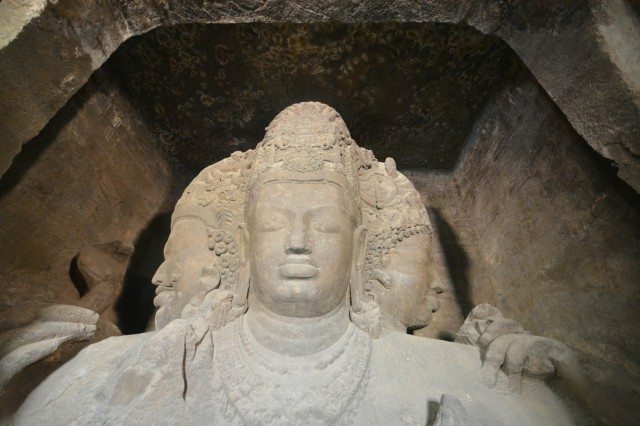 Point to note that this is not a sculpture of Trimurti – Brahma , Vishnu and Mahesh but these are faces of Shiva only. There has been tradition to carve faces on Shivling as well. And based on number of faces, the shivling gets the name from Ekmukhi to Panchmukhi. Although the common man thinks these are 3 faces, the experts have always more to add. Stella Kramrisch is one such expert in Indian iconography. She has proven that these are not 3 but 5 faces. There are distinct names to each of the face and it really represents the attribute of colorful character of Shiva. Five faces of Shiva represent five elements, Ishana (sky), Tatpurusha (wind), Aghora (fire), Vamadeva (water) and Sadjoyata (earth) and together this depiction is called as Sadashiv as per iconography. We see three faces and there is one assumed to be behind and one on top. The entire cave is home to huge sculptures occupying a wall or more. Most of the sculptures are related to pauranik stories about Shiva. There is an exquisite ‘Kalyan-Sundar’ frame depicting the marriage of Shiva and Parvati. And there is ‘Gajasur-Vadh’ pictured with Shiva standing tall with elephant skin in his raised arms. Apart from sculptures, the cave is devoid of any ornamentation. The large pillars supporting the great hall, the larger than life sculptures of door keepers near the main shrine hosting Shivling , the corner walls with large size sculptures, the ‘expanse’ is the keyword here. The abundance of space and magnificence of form is something that creates a forceful impact. Also this cave has good amount of similarity with some Ellora caves e.g. Sita Nhani. The next cave we moved to had a huge open hall, an entrance and unbelievably carved wall all around the entrance door. The carvings had the usual flowers and trees and people. Out of the other 6 caves, only one of them is worth mentioning. The huge open chamber and elaborate doorway carvings are prominent. The Elephanta island itself is very scenic. It is wooded and well maintained, in the middle of the sea, just a bit away from throbbing citylife, it is like a peaceful reading corner in your own home, approachable and still secluded. Being part of coastline, the rains and bridght sunshine have deteriorated the caves. Still the question remains in mind as how and who would have come to this tiny island and why would they have carved these caves. Ancient texts refer to a place called ‘Puri’ in the vicinity of present day Mumbai thought to be part of Shilahar kingdom and experts feel it is same as ‘Gharapuri’ . The name of this island is given by Portuguese who visited this island and saw huge statue of Elephant at the entrance. Promptly destroying it, the island however was named Elephanta. Apparently this half broken statue is at site museum which we could not see. Moving closer to home, again in the ravines of Sahyadri was one more abode of Mahadev waiting to be explored. Another fine winter morning and mild golden sunrays accompanied us to the small town of Ambarnath in vicinity of Mumbai. Ambarnath is typical Konkan town with small roads and small houses interspersed with leafy trees and red black soil. One of the milestones of Yadav architecture, temple of Ambarnath is located just inside the town. As you park the vehicle and pass a stinking river which could be gutter, your hopes are about to dampen. The careless and casual attitude of allowing filth to grow and add to it with mindless rituals generating more garbage, is something we all need to think seriously. But then you enter through the open courtyard and the next you see is the rock carved marvel that our ancestors created and time preserved for us. 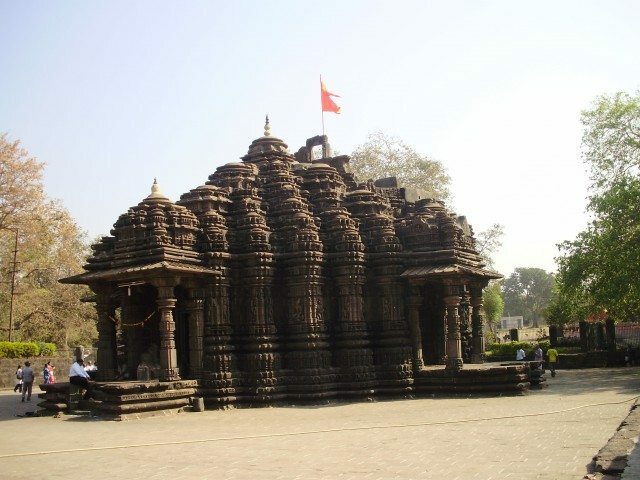 Built probably in early 11’th century, temple of Ambarnath is dedicated to ‘Amareshwar’ a form of Shiv. One of the early ‘Yadav’ period temples, this was built by Shilahar king ‘Chedraj’. The ‘Shikhar’ is not very visible but the ornate star formation of temple plinth is at once elegant and magnificent. 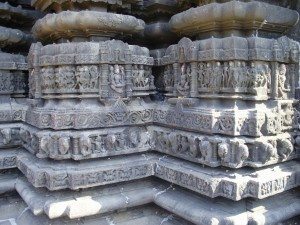 Built in local Deccan black stone, the walls of the temple and the ‘Thar’ at the base of the walls offer plenty of examples of masterful sculpting. The inner sanctum needs to be reached by climbing down a few steps. It has always been a unique feeling in most of the Shiv temples, when you enter the Garbhgrih, the inner sanctum. Many a times it is descent into the dark core of the temple only to be presented with the image of Shivling, surrounded by white flowers and combined fragrance of petals, oil lamps and incenses creating the familiar atmosphere. The slow drip of ‘Abhishek’ and echoing chants of ancient words, sitting in the quiet corner of that age old sanctum the peace of mind returns for sure.. The last stop of this time travel is in the bustling heart of Pune city. JM road in Pune is famous for jazzy showrooms of Nike and Benetton. It is also famous for Pizza huts and McDonald’s first ever outlets in the city. On the same crowded and upwardly mobile road, you will find a tranquil green sanctuary of peace and faith preserved with great care. 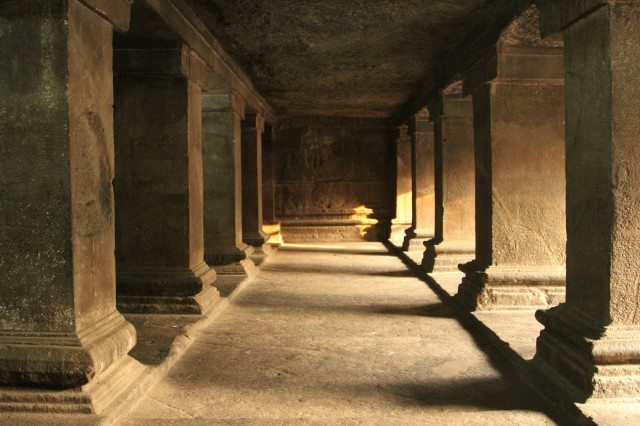 ‘Pataleshwar’ are the eighth century cave temples built during Rashtrakoot period. Pataleshwar is an example of rock cut monolithic architecture as seen in contemporary Ellora caves. As you enter though a pathway flanked by 2 massive boulders, you see a circular structure mounted on 12 columns and a square platform within. There is a Nandi sculpture sitting here which could be later addition. Facing the Nandi in the rocks are the actual caves. 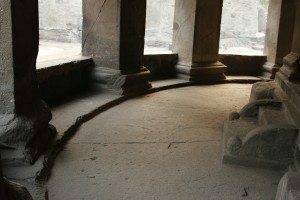 There are 3 distinct chambers carved next to each other. The central one has a shivling. Before that there is a huge horizontal outer hall and crisscross of massive pillars. With low focus on ornamentation, the caves exude spaciousness and seriousness. 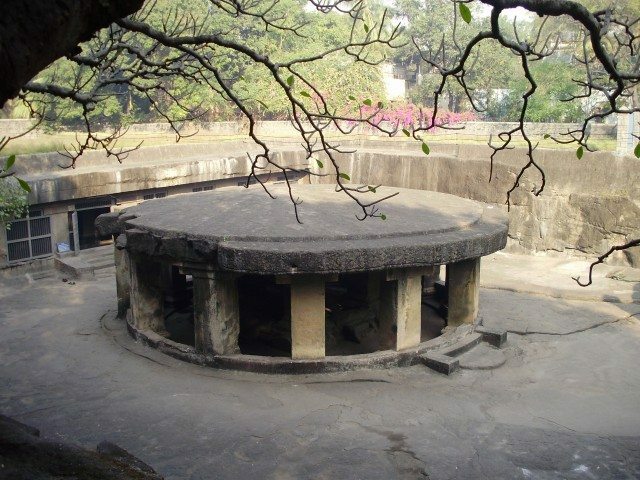 More than the neatly carved caves, the circular structure in the courtyard is something your attention is drawn to. There is an inscription on the outer walls of the cave. The opposite walls of inner hall could have hosted sculptures, but nothing can be identified now. Mornings are best in Pataleshwar, as chirping sounds of birds complement the flower laden trees of Devchafa and rain trees. The area is host to several old trees guarding the place with quiet authority. 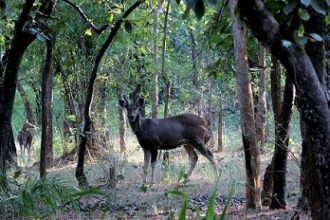 In the same premise there is shrine dedicated to ‘Junglee Maharaj’ an ascetic who lived in forest. And now you would know what JM in JM road stands for! What a coincidence that this indeed turned out to be a ‘tridal’ , three separate journeys to three majestic abodes of The Destroyer woven together. Not a natural Bilvadal but a virtual one for sure ! Very intelligently written post adorned with the captivating snaps. The architecture of Ambarnath Temple is really exquisite. I enjoyed the post thoroughly. Thanks for sharing. Very interesting and informative post. Intelligently chosen three places to explore and share the joy of traveling. Mumbai generally known as crowded and glamorous city life, you took the gems attached to the city. Detailed description of the sculpture named Trimurti Mahadev and five elements are very impressive. All photographs are attractive. 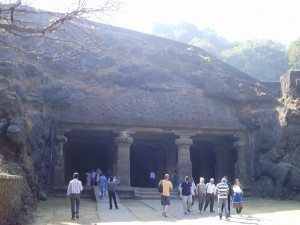 On the other day only I was reading about Elephanta Cave and I was planning how to do it whenever I will go there. I am not fortunate enough to visit the place though I went to Mumbai. Ambarnath : I loved reading about it, this was not known to me. You have so beautifully said that our ancestors created and time preserved for us, very true, Mam. Surely goes in my wish list. Pataleswar : Again a great introduction of a place. Very well described equally supported by beautiful photos. @Nandan : We have been taking about this. It has come again through this post. The matter is garbage issue in Ambarnath. I personally feel that Ghumakkar being a responsible forum must pen down the observation of Manisha Ji, she may give her input further, and send the same to the concerned authority of tourism department. I hope with this little step we will serve for the better. Thanks Manisha Ji for sharing and hope to read more of your travel stories. Thanks all for reading it and liking it. Anupam ji, I could have added details and photos of all those frames which you have mentioned, but then it would have been a very big post. Sine i wanted to cover 3 places, i tried to optimize ! Do read my past stories ( plenty of them) on Ghumakkar by clicking on my name, hope you will enjoy them. A very nice article Manisha , as usual ! However here are a few suggestions for the info that u might feel like incorporating. Pl note that scholars believe that the name Gharapuri has been derived from the name ‘Agraharapuri’. You must have seen the map of the island at the entrance of the cave (which does not have pot based pillars in fact they have cushion capitals) telling you that there are two hills on the island. The hill with the cave is called as the gun hill / canon hill as there is a canon on top of it, and the other one is a stupa hill. There is a structural brick stupa, with vegetation on it, waiting to be excavated on that hill. There are rock cut tanks near the stupa and there also are some caves there. Secondly, the Ambarnath temple was not constructed by Chediraja, but was started by Mummuniraja in 1060 AD. 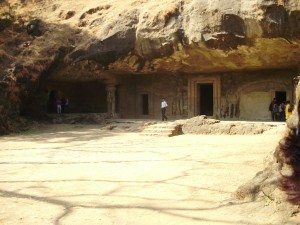 Thirdly, the Pataleshwar caves do not seem to have been the Buddhist caves. Considering the location, space available for excavation one fells that the Nandi Mandap was planned right from the beginning. Keep on writing such travelogues…your language is very good and the style of narration keeps one’s eyes glued to the text. Thank you Manjiri Madam for your kind words! Thanks for a lot of important information, have incorporated as far as possible. Regarding Ambarnath, Chedraj reference is from Pracheen Kalabharati ( M. S. Mate). Regarding Nandi mandap of Pataleshwar, the current Nandi almost looks like a later addition, not to forget one more Nandi in the courtyard. But again many thanks for reading and suggesting corrections. The art of travel writing, crafted intelligently, made it a lovely read. As always, I like your posts. Thank you Manisha for your lucid narration of tester-years’ creations. The title doesn’t give anything away (which may not be good from ‘Search Engine’ angle) and as we discover and learn about new places, it doesn’t feel like we are hopping. The continuity and the movement from one place to another is too sublime for any interruption. I guess, some more practical info around ‘What to see’ and ‘What to avoid’ would have added more value to the post. @ Anupam – Ghumakkar is up for alerting relevant authorities. I believe Ajay wanted us to wait for a good time (and after the series is done) to send suggestions/complains to Gujrat Govt. So we are doing that. For this one, we can send a note to ‘Maharastra Tourism’ on ensuring better experience for travellers headed to ‘Ambarnath’, if Manisha feel that it is appropriate. All said, thanks again for highlighting this. A very skillful & flawless write-up. Am I wrong if I say, most of us here must have visited Elephanta more than a couple of times but none took pain to pen down so emphatically. Hats off for that Manisha. Agree with Nandan, the caption should be easily accessible for befitting browsers. Ghumakkar, as rightly mentioned by Anupam is a forum comprised of responsible & I must add to it, intellectual members which is why people from all walks of life add their bits with their valuable remarks & information. @ Nandan, I will soon finish the log on my Road Journey. Why I wanted you to wait, was just to be cerebral while compiling the grudges & not only should we complain but also advise the concerned authorities to act accordingly with our expert opinions and practical knowledge. Who else than Ghumakkars do that in the best way. We may discuss on the issues in our forum and incorporate everyone’s uncanny suggestions on the grave situation. Better late than making abortive efforts. Thanks Jaiashree, Nandan and Ajay for your kind words. Let me add relevant ‘search’ terms in the title. Regarding raising the topic of filth at Ambarnath, let me know what help is requried. As always an enjoyable post written in your poetic style. 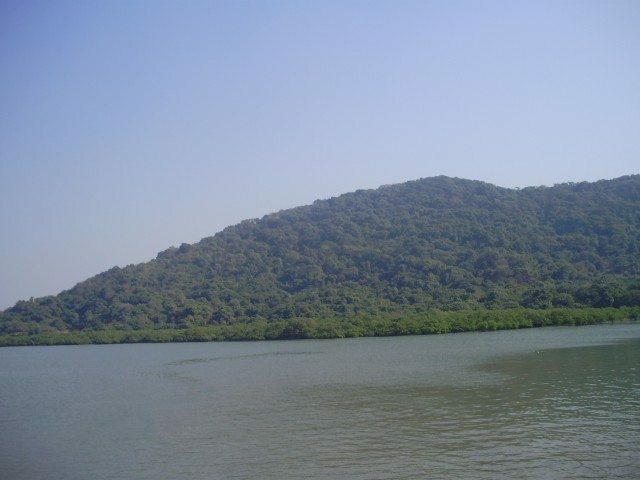 Gharapuri Island seems magical and unbelievable that something so green could exist so close to Mumbai! I just wonder if something like Maharashtra Tourism actually exists! 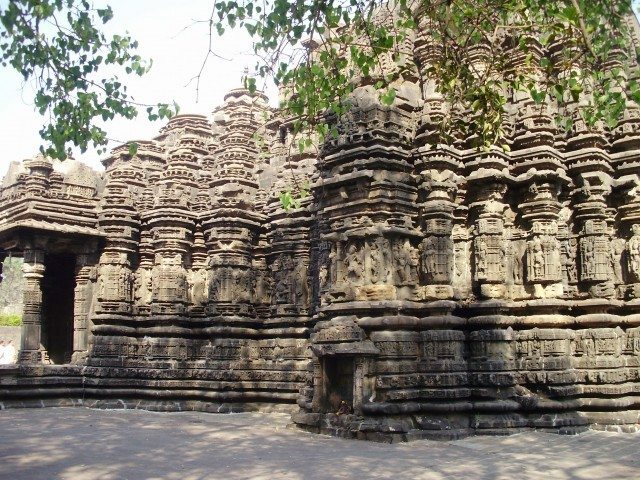 I dont see any signs for the attractions in Maharashtra and only if you know or someone points them out or you are just lucky that you get to see the the wealth of temples and forts in the state. Yesterday just by chance I saw the temple on the banks of Godavari betweeen Nagar and Aurangabad. It turned out to be beautiful and mercifully ASI was conducting clean up work on the outer walls. And of course, thanks for letting me know about Pataleshwar which I saw last time. Now that I have begun to appreciate and understand iconography a little, I liked all the information. And yes, like suggested before add Place Names in the photo titles so that post get picked up by google as again suggested by friends here. Thanks Nirdesh. It is true that Maharashtra Toursims is more into ‘neglect’ than ‘encourage’. Hoping that things will change. I read it again and its a masterpiece. More so when you have been to Mumbai and Pune and have no clue of these places. One the issue of faith and upkeep, I would hazard a guess that I would have written to Maharasthra Tourism. This is really informative post with awesome images. Maharashtra is one of the most favorite destination among the tourist as it’s offers variety of option and tourist places. I have been looking out for a 11th century temple dedicated to Lord Shiva. The linga is supposed to be black in color. The temple is shaped like a STAR Shape. This temple lies, may be, in the midst of THANE, Maharashtra, deep inside the Industrial Estates of Thane and is hidden. Not many, I guess should be knowing about this. When questioned about my Moola Kula Devata to a Trinetri, a Clairvoyant, closing his eyes, he was able to see a STAR Shaped Temple. He could see Industries all over, with sheds and other industries that have totally masked out this lovely beautiful temple. He went through his astral travel to locate this temple, he found it in the midst of the Thane Industrial Estates. Probably, you, with your knowledge, can highlight me abut the existence of this temple at the above mentioned site. Love to hear.